SSAB’s operating profit for Q2 2018 was SEK 1,630 million, up SEK 425 million compared with Q2 2017. Earnings were also up compared with the prior quarter, primarily driven by SSAB Americas,. The quarter was characterized by continued good demand and favorable pricing in our markets. We increased volumes of high-strength steels in both SSAB Special Steels and the Automotive segment in SSAB Europe. SSAB Special Steels is experiencing strong demand in all segments and especially within heavy transport and mining equipment. 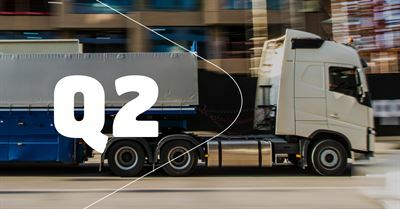 Shipments during Q2 were 339 thousand tonnes, up 12% compared with Q2 2017 and operating profit was up SEK 161 million to SEK 522 million. Demand in Europe is steady and at a good level. SSAB Europe's shipments were 963 thousand tonnes and operating profit for the quarter was SEK 907 million. The transformer fire at the rolling mill in Hämeenlinna impacted earnings negatively by around SEK 50 million. SSAB Americas’ operating profit was SEK 365 million, up SEK 326 million compared to Q2 2017. Demand has improved and market prices for heavy plate have risen sharply since November last year. However, contract prices and lead times mean a certain delay before these higher prices are reflected in SSAB Americas’ earnings. The USA introduced tariffs on steel imports from the EU and a string of other countries during Q2. Local production accounts for around 90% of the Group’s shipment volumes in the USA. SSAB is working with customers to be granted product-based exemptions with regard to those volumes that SSAB Special Steels and SSAB Europe export to the USA from Europe. HYBRIT, our initiative for fossil-free steel, is progressing to plan. During Q2, the Swedish Energy Agency decided to grant more than SEK 500 million in financial support to HYBRIT to build a pilot plant. Construction started in June and the pilot plant is expected to be completed in 2020. Despite the political turbulence surrounding trade barriers, we expect the outlook to remain good for the second half of 2018. SSAB has strong market positions in our home markets and we are on track towards achieving our strategic growth targets for 2020. All in all, we have good opportunities for continued profitable growth and to generate strong cash flow. SSAB invites you to a presentation of the quarterly report at 9.00am CEST on Friday July 20, 2018. The press conference will be held in English and live webcast on SSAB’s website www.ssab.com. It is also possible to participate in the briefing via telephone. Venue and time of briefing: World Trade Center (WTC) Stockholm, Kungsbron 1, Conference room Manhattan, 09.00am CEST. This information is inside information that SSAB AB (publ) is obliged to make public pursuant to the EU Market Abuse Regulation and information that SSAB AB (publ) is obliged to make public pursuant to the Securities Markets Act. The information was submitted for publication, through the agency of the contact person set out above, at 7.30am CEST on July 20, 2018.